I know this game like the back of my hand & I'm giving out sound advice which is probably going right over most people's heads. That aside on yesterday's newsletter I called it spot on again when suggesting mid March is always a turning point as more perfect Spring salmon were caught on the Tay. I fully understand why on the face of things Spring salmon fishing can appear to be more of an SAS endurance test rather than a tranquil day by the river but look deeper at the game you're playing and the truly phenomenal prize that's at stake. Understand the 'little windows of opportunity' that appear on all fishing days from mid March that can easily be 'missed' by even the highly trained 'river eye' of a professional Tay ghillie. 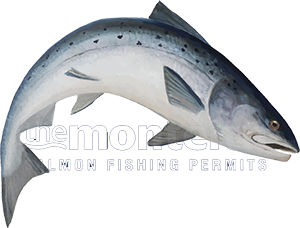 To catch a Spring salmon you need to be tuned in to a higher level of awareness and have the faith to thoroughly execute your daily fishing plan with daily & 'ceaseless' consistency. The traditional River Tay 'harling' boats are the most effective way to cover the big deep pools of the Tay during the higher early Spring water period as the reduced fishing angles of the boat's 'harling' lures are slowed up to a point where a professional boatman can 'hang' the lures momentarily over the salmon lies. This level of slower cold water presentation is seldom achievable from the riverbank over the Tay's more distant salmon lies. The boat is deadly as salmon lie water coverage is truly maximised as is the highly effective 'multiple' lure swim time from lures that don't lose 10 seconds every minute while being recast. For those of you who are more fly orientated my hat is off to you and I'm one of the few who would always prefer to lead with the fly too. On the Tay however she's a different beast through the Spring months and sometimes needs that extra level of presentation the boat can offer to unlock the silverware that's always present in her safe! Our British record salmon was taken from the boat at Glendelvine and there's nothing to be frowned upon with that famous fish or its lady captor. Yet again yesterday a fine head of fresh run Spring salmon snooped right up the Tay and several beats got a got a hold of a few of them. Notably the Glendelvine beat got in front of 3 perfect specimens to 22lbs and the Dunkeld House beat scored twice with 2 rapid heavyweights to 24 lbs. On Dunkeld House yesterday the Head Ghillie's sanity was questioned by one of his riverbank fishers for daring to go out in the boat during the blizzard and that is exactly why not many Spring salmon are caught on the Tay during the early months as the fire in the fishing hut is 'naturally' far more appealing during these often normal 'baltic' Spring weather conditions. The only daytime fire I was ever conditioned to accept was the one that was 'ready' to be lit at 1pm or 5pm 'after' a Spring harling shift was over or the less attractive fire at the 'creamery' after the last cast has been made! As a beat ghillie I'd be out in all conditions with my eye constantly on riverbank markers between each perfectly measured swing of the boat to ensure 100% consistent boat water coverage through all the likely salmon pool holding areas. Letting the lures swing right into the river margins was crucial too so I was never too quick on the turn to miss the often 'close in' Spring salmon lies & running zones. These days many guess what they're covering and fish the slack clutch which negates that often gentle Spring 'dunt' from sticking. Look closely at the amazing beauty of these 2 Dunkeld House heavyweight River Tay Spring salmon from yesterday and be honest with yourself as nothing comes close to a wild Atlantic salmon in Spring battle dress. The power and instant realisation that this is no kelt within seconds of connecting will set your pulse on fire and freeze lock your focus like time has stopped still. This is more than catching a fish and much more like a highly fortunate personal interview with God's finest marine creature. A Tay Springer is a survival specialist & top predator and has the most beautiful iridescent coat of oceanic camouflage. 'Beware' you don't get addicted though and you have been forewarned!